Are you looking to rent an office in Amsterdam? For your one-man business, start-up or for an existing company with a team of permanent employees? In the perfect location? At Tauro, you can rent an office in Amsterdam in any size to suit your needs. The office spaces of Tauro are situated in Teleportboulevard 110, just 15 minutes from Schiphol and easily accessible by car and public transport. Naturally, we provide sufficient parking facilities. And we haven’t forgotten about online accessibility. We have our own LAN connection. You can rent an office in Amsterdam starting from 25 m², on short-term and flexible leases, if so desired. It almost seems impossible: to rent an office in Amsterdam at affordable prices. At Tauro, however, you can! Our office spaces in Amsterdam constitute a total floor area of 11,000 m². Our office units vary in size and can be clustered, if desired. All office units are semi-furnished and equipped with modern office facilities. And our offices are competitively priced. 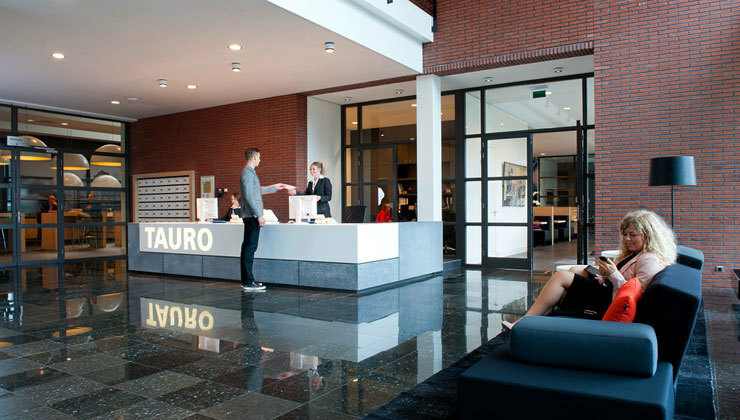 In short: at Tauro, it is possible to rent an office in Amsterdam at great prices. As a small business owner, you, too, can rent an office in Amsterdam easily and at a great price. The Tauro Smart Work Center is the perfect starting point for your business. With no lease to tie you in, you can make use of a workspace, only paying for the number of hours you use it. Choose your own office unit or a workspace shared with other entrepreneurs in the Tauro Entrepreneurs’ Lounge. Take advantage of our catering service, reception services and start your working day with a delicious, fresh cup of coffee. Organising a meeting? This, too, can be easily arranged at Tauro. Doing business begins with renting an office in Amsterdam. Looking to rent an office in Amsterdam? Make an appointment now by clicking the button on the right of this page!